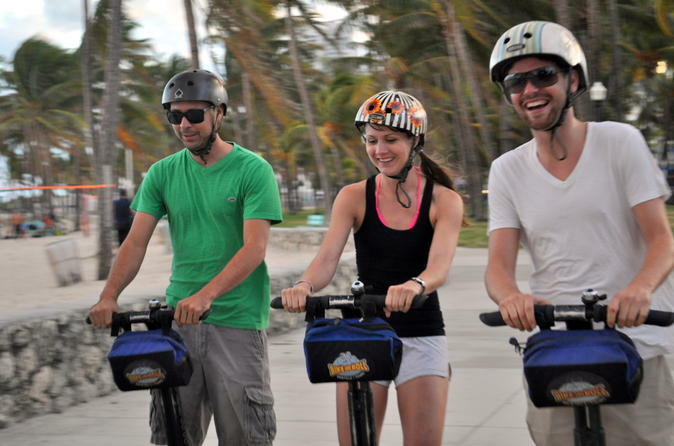 Treat yourself to beautiful views on this scenic sunrise or sunset segway tour. Cruise around Miami Beach and South Beach and enjoy views of the Biscayne Bay waterfront, Fisher Island and Downtown Miami as you explore South Pointe Park. You'll make photo stops to marvel at a lovely sunrise or sunset over the water. This is a great way to explore this city with ease, and you’ll end in time for a day or night on the town! Meet in Miami Beach for your 30-minute safety orientation. Once you feel comfortable on your Segway, follow your guide on a scenic tour. You’ll then cruise through South Beach, the center of Miami’s nightlife. This bustling area features sandy beaches, high-end restaurants, Art Deco architecture, great shopping, hip clubs, cultural attractions and endless recreational activities. Along the way, stop to take photos of impressive attractions and landmarks with a beautiful Miami sunrise or sunset as your backdrop. Your tour concludes back in Miami Beach, just in time to kickstart your day or night on the town!